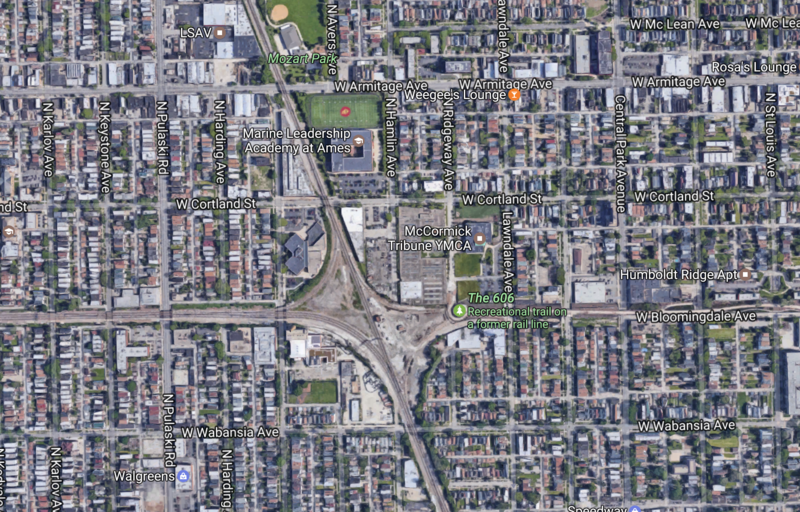 Watch Metra trains at the west end of the Bloomingdale Trail from a bird's eye view. Image: Steven Vance. Attention all railfans! Here’s some mind-bending drone footage of Metra trains passing by the west end of the Bloomingdale Trail, aka The 606. (You can’t actually see the elevated greenway in this clip.) It was shot by Streetsblog Chicago’s Steven Vance, originally published on his personal blog Steven Can Plan. As Steven explains in his post, the Bloomingdale, which was built on former Canadian Pacific right-of-way, goes no further west than Ridgeway because there are active freight and passenger lines west of that. The corkscrew-shaped observatory mound at the west end of the trail provides a view of the Pacific Junction, where tracks for Metra’s Milwaukee District North (to Fox Lake), North Central Service (to Antioch), and Milwaukee District West (to Elgin) lines converge with Amtrak service in a triangular intersection. But you can’t really see the greater West Side from this vantage point, so Steven’s aerial footage shows you what you’ve been missing. Metra trains at Pacific Junction from Steven Vance on Vimeo. At the start of the video, the camera is facing south, and we see an outbound MD-N train coming from downtown. The drone pivots north to follow the train as it passes by the triangular former Magid Glove factory building, the one with the shattered green windows. That property was slated to be turned into an access park for the Bloomingdale, but the initiative was put on indefinite hold due to a freeze on state funding for park projects. (Thanks Governor Rauner.) The drone follows the train as it disappear to the north, passing by McAuliffe elementary and Ames high school. In the second half of the clip, we’re facing south again (obviously the Sears Tower is visible to the left of the frame) as another Metra train comes from the Loop, either an NCS or MD-W run. Steven backs the drone up a bit (it’s a DJI Mavic Pro) to capture more of the train as it makes a western turn towards Antioch or Elgin. Amazing what you can see when you get up above it all.